Gumbo is perhaps Louisiana's most evocative and storied dish. There are twice as many variations on the rich stew as there are families in the state, and everyone thinks their family's way is best. But what is it, really? What makes it different than a regular soup? Which variant is the most traditional? Let's dig deeper. "Gumbo" first appeared in print sometime in the early 18th century, but may have first referred to a dish that was simply stewed okra. The dish is an only-in-Louisiana amalgamation of African, Native American, Spanish, German, and French cuisines and ingredients. The name "gumbo" likely comes either from the Bantu (West African) language word for okra, "kingombo," or the Choctaw word for filé, "kombo." Filé is typically added to the gumbo after it has been taken off the heat, but roux and okra are added during the cooking process. Gumbo main ingredients typically include game meats, chicken, sausage, and shellfish, though the combinations thereof vary depending on regional differences, seasonal availability, family preferences, and the whimsy of the chef. Seasoning vegetables are almost always the Holy Trinity of Cajun cuisine: celery, onions, and green bell peppers, and these are chopped fine and cooked until they are no longer identifiable. Some cooks might add garlic or red bell peppers, and Creole gumbos sometimes include tomatoes. Seasoning herbs and spices are highly variable, but almost always include salt, cayenne pepper, and black pepper, and may also include white pepper, bay leaves, thyme, parsley, or others. Gumbo is always served over (or on the side of) rice, and traditionally, Louisiana rice is cooked with the goal of making fluffy, individual grains that don't stick together. Cajun chicken and sausage gumbo is also often served with a side of creamy, mustardy potato salad, which some people will combine with a bit of gumbo in each bite. Some cooks will sprinkle chopped green onions or parsley over the top of each bowl of gumbo as a garnish. If you've never had it before, you can expect that almost every variety of gumbo will have a certain rich smokiness. This comes from the dark roux. Varieties that contain sausage will be even more intensely smoky, as andouille sausage and other smoked varieties are the gumbo sausages of choice. Some seafood gumbos are made without a roux, and they obviously won't have the same dark flavor. Okra gumbo can be slightly slimy or gooey, depending on the amount of okra that is used. If that texture bothers you (that might be the case if you don't like oysters or mushrooms because of their texture), don't order an okra gumbo. Filé gumbo is rich and earthy and has a fairly unfamiliar flavor (if you can, try to imagine unsweetened root beer—sassafras is also the main flavoring ingredient for root beer as well, and they share an earthiness). Gumbo tends to be heavily seasoned but is not typically burn-your-mouth spicy. If you are not accustomed to any spicy foods, you might find it too hot for your tastes, but it's much less spicy-hot than most dishes you'd find at an Indian or Thai restaurant. As with most Cajun and Creole foods, gumbo is typically served with a variety of hot sauces at the table, so you can bring it up to your own preferred spice level. Creole Gumbo is the most commonly found variety in New Orleans. It typically has a roux base and is loaded with chicken, sausage, shellfish, okra, trinity, and sometimes tomatoes. Cajun Chicken and Sausage Gumbo is found in New Orleans and throughout Southern Louisiana, with an infinite number of minor variations. It has a roux base, contains chicken and sausage and trinity. It is sometimes served with filé powder at the table, to add at your own discretion. In and around Evangeline and St. Landry Parishes, chicken and sausage gumbo is often served with hard-boiled eggs floating in it. 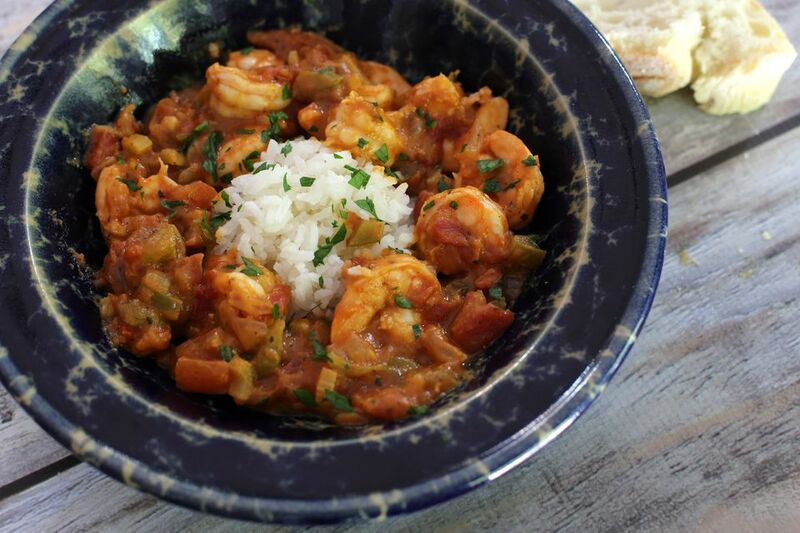 Seafood Gumbo has as many variations as you can imagine, but often includes shrimp, crab, and oysters, as well as any number of "catch of the day" fish or shellfish, and sometimes sausage. It's made with a fish stock and tends to be quite fishy (if you're looking for a mild fish dish, this is not the one for you). It is typically made with a roux base, and okra is optional depending on the region or the season. Seafood gumbo has some things in common with bouillabaisse, and culinary historians have drawn links between the two. Gumbo z'Herbes is the gumbo that breaks all the rules. It's not really gumbo by the definitions laid forth above, but it's been bearing the gumbo name for a couple hundred years, so who's to argue. This soup, which is probably related to Caribbean callaloo, is a typically meatless soup made of a mixture of different greens, cooked and pulverized into a rich, delicious liquid that is a popular recipe for the meatless Lenten season. The name, pronounced almost like "Gumbo zeb" comes from the French "gumbo aux herbes," which means "gumbo made of greens."